Frederick County is home to several state and federally designated scenic roadways, referred to more commonly as "byways". Not only do these routes assist travelers in getting from point A to point B, they also represent tourist destinations unto themselves. Five out of Maryland&apos;s nineteen designated byways traverse Frederick County and are marked with the Black-eyed Susan scenic byway signs. The County and City of Frederick have the unique distinction of sitting at the crossroads of two nationally designated scenic roadways - the Historical National Road (US 40) and the Catoctin Mountain National Scenic Byway (US 15), Maryland&apos;s portion of the Journey Through Hallowed Ground. 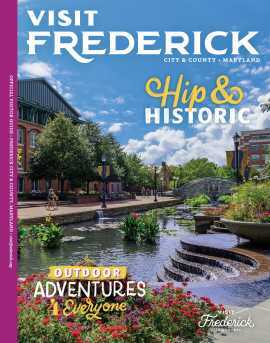 A Maryland Scenic Byways Map with driving tour itineraries is available online or at the Frederick Visitor Center. Thousands of Union and Confederate soldiers marched over the county&apos;s sometimes muddy, often dusty roads. The beauty and grandeur of Frederick County was the last thing written home about, by many a soldier who would not make it through the major conflicts that identify the American Civil War. Individual trails focusing on the 1862 Antietam Campaign and Gettysburg Invasion and Retreat of 1863 shed light on what many of these troops experienced, most far from the comforts of home. Those who planned and designed the C & O (Chesapeake and Ohio) Canal saw it stretching from the Potomac River near Washington D.C., to the Ohio Valley. Work commenced on July 4th, 1828, but the challenges and costs experienced were far greater than estimated. By 1850, the canal was complete from the mouth of Rock Creek in Georgetown to Cumberland in western Maryland. The canal never made it further west, with the Ohio River as its goal. Despite its problems, the canal was a busy waterway for the transport of coal and produce until it closed in 1924. Frederick County&apos;s portion of the canal includes two of the 11 aqueducts built along the route, a Lock House at Lander, plus the C&O Canal Visitor Center located in Brunswick in the same building as the Brunswick Heritage Museum. On this tour, you will explore the quaint towns and villages of Carroll and Frederick counties that, paying particular attention to the old Main Streets that were the hub of activity for each town and the surrounding countryside. These Main Streets are still busy places offering the atmosphere of bygone days along with an enticing variety of antique shops, country inns, and restaurants. The route takes you through the northern Frederick County towns of Emmitsburg, Thurmont, and Libertytown to name a few. As the first federally funded road, the Historic National Road provided a gateway to the west for thousands of settlers and travelers alike. Beginning in Baltimore, the National Turn-Pike reached Frederick and the Appalachians Mountains, further extending through Pennsylvania, West Virginia, Ohio, Indiana and ending in Vandalia, Illinois. Since its inception in 1807, the National Road began as the Baltimore & Frederick Town Turnpike. The new "smooth" road was responsible for opening Frederick to trade both east and west, quickly turning a small town into a city. Neighboring villages such as New Market, Mount Airy, and Middletown grew up along the famed roadway in like fashion - offering lodging, dining, support services (eg. blacksmiths/wheelwrights) and depot facilities for trade goods. Many of the old turnpike&apos;s original mile markers still exist and can be found on the north side of the roadway. In addition, several interpretive markers help tell the local story along the Historic National Road&apos;s route. The Maryland portion of the Historic National Road measures 170 miles, crossing through seven counties. The Catoctin Mountain National Scenic Byway is Maryland&apos;s portion of a 4-state heritage corridor known as the Journey Through Hallowed Ground, stretching from Gettysburg, PA to Monticello in Virginia. Traveling 38 miles across Frederick County from south to north, the Byway begins at the Potomac River and Virginia line, adjacent Point of Rocks, and winds along the picturesque Catoctin Mountain Chain up to the Mason-Dixon Line (Pennsylvania border). Along its route, the Catoctin Mountain National Scenic Byway is dotted with local and nationally recognized attractions, natural areas and parklands, important historic and cultural sites, and vibrant economic Main Streets. Catoctin Mountain and the historic agricultural landscape of Frederick County provide a setting that is charming and beautiful to both residents and travelers alike. The Journey Through Hallowed Ground corridor follows US Route 15 and Route 20 on a 175-mile meandering course from Gettysburg, Pennsylvania, through Frederick County, Maryland and ending in Charlottesville, Virginia. The "15 on 15" touring itinerary will guide you to some must-see sites along the corridor.